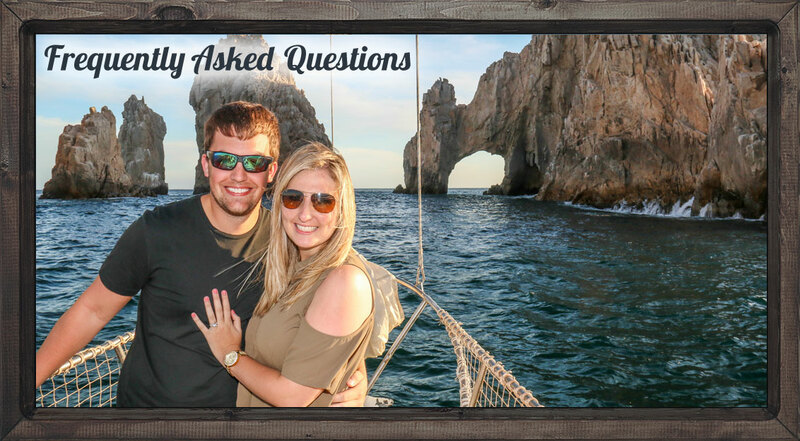 Answers to all Frequently Asked Questions about our tours. How to book, what is included, what to bring, what you will see, special requests – anything you want to know. Are food and beverages included in the tours? All tours include a Mexican combination platter, fresh guacamole, salsa & chips, fresh fruit & vegetable platter and premium open bar. Please see our MENU page for additional details. Can I make a special request for the tour? We are happy to accommodate special requests. Please let us know if you have a special request for food or beverages or special occasion items such as flowers, birthday cake or champagne. We strive to ensure your cruise will be one of the most memorable moments while you discover this extraordinary Land’s End paradise. Is snorkeling gear included for all tours? 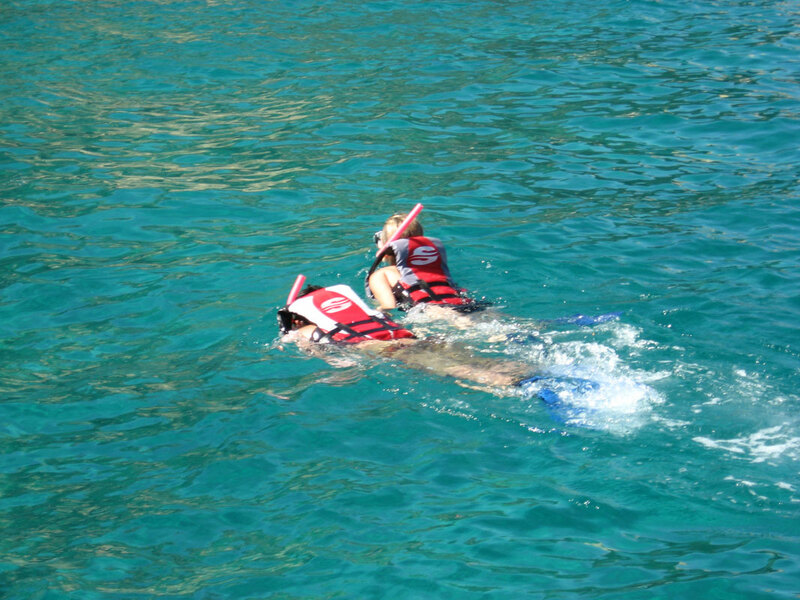 Life vests are provided on all tours for guests 3 years and older and snorkeling gear and floating devices are provided for guests 8 years and older. Snorkeling conditions are best and recommended during the morning and early afternoon departures due to better lighting and visibility however if you would like to snorkel prior to the sunset, you are welcome to enjoy the activity. Can I bring babies and young children on the tour? Children of all ages are welcome. There is lifeline netting all around the decks of our sailboats for your entire family’s safety and we provide life vests for all guests 2 years and older. Is there music on your boats? All of our boats are equipped with stereo systems and include iPod connections. What sightseeing areas will we see during the tour? 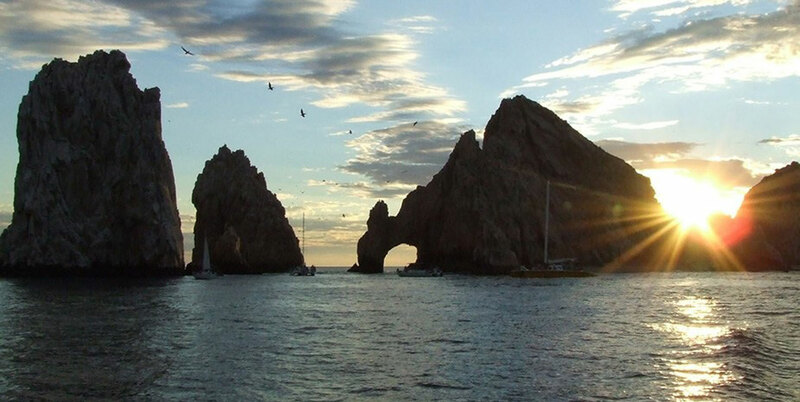 All of our tours include sightseeing to Los Cabo’s most famous natural landmark, El Arco (The Land’s End Arch), Lover’s Beach, the Sea Lion Colony and around the magnificent Finisterra Rocky Point into the Pacific Ocean and Sea of Cortes. 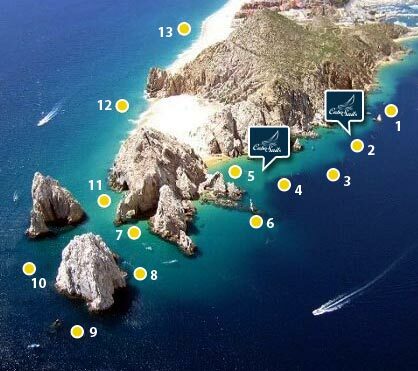 During the snorkeling tour, you will enjoy snorkeling around Pelican Rock which is the most visually stimulating snorkel experience in Cabo San Lucas. How do I reserve a tour? You can purchase directly on our website by clicking “Book Now”. You will pay a deposit to confirm your reservation and then we will send your confirmation with all the details. If I am coming from a cruise ship, how do I get to your location? You do not need to pay for any transportation to our location as we are conveniently located directly next to the cruise ship pier. Once you walk out of the cruise ship terminal (pier), walk to the right along the marina and we are located at the next Dock 4 in front of Senor Frog’s Restaurant. We are less than a minute walk from the cruise ship pier. Can we participate in sailing the boat? We welcome our guests to take the helm, participate with the crew or simply relax. Should I bring anything on the tour? In the winter months, we recommend a light jacket for the sunset sail. If you plan on snorkeling or swimming, bring your sun block and towel. Don’t forget your camera for magnificent photographs! An iPod connection is available. 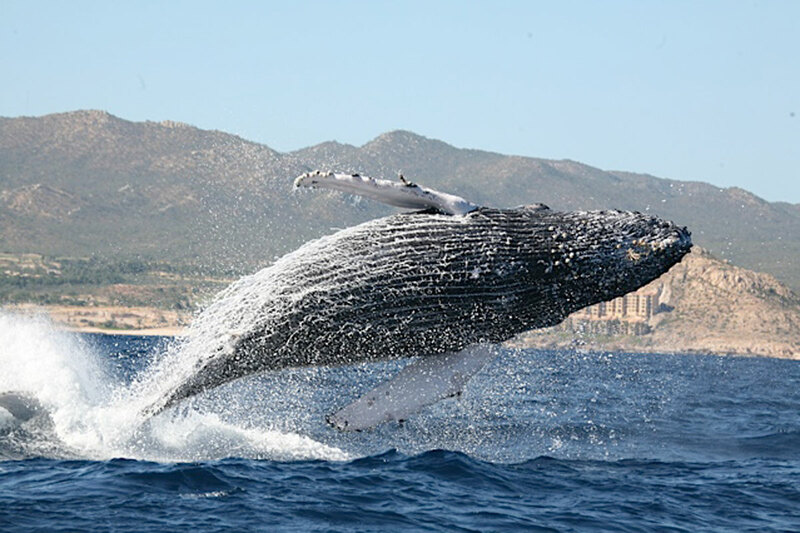 Whale watching season in Cabo San Lucas is from mid December through March. Peak season is January and February. Any time of the day is best to see these gentle giants. When do you hoist the sails? We motor out of the marina to Land’s End. 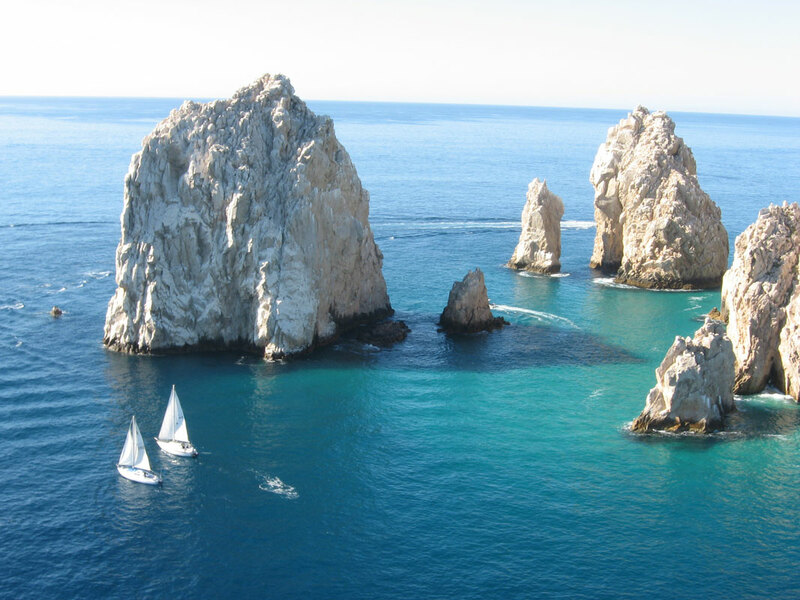 Once we arrive at Land’s End, we hoist the sails to enjoy sailing in the Pacific Ocean, Sea of Cortes and the Cabo San Lucas Bay. Cabo Sails offers the best crew in Cabo and amazing Mexican hospitality! Nov 4-Feb 24 4:00 p.m.
Feb 25-March 31 4:30 p.m.
April 1-June 14 5:30 p.m.
June 15-Aug 14 6:00 p.m.
Aug 15-Oct 27 5:30 p.m.
Oct 28-Nov 3 4:30 p.m.
• Once we receive your deposit, we will send your confirmation with all the details within 24 hours. • Directions to our check in office will be provided on your confirmation. You may pay the remaining balance the day of your tour with dollars, pesos, Visa or MasterCard. We do not accept American Express. Credit card payments for the remaining balance have an additional 5% bank service fee. • Prices are in U.S. dollars and include tax. • Prices are honored for morning, afternoon & sunset tours. • Gratuities for the crew not included. • Please bring your towels and sunscreen. • Tanning accelerators are not allowed on board as they stain our cushions. Gratuities for the crew not included. What differentiates Cabo Sails from other companies? • Cabo Sails is the premier Cabo sailing company with 15 years of offering our guests exceptional quality and service. 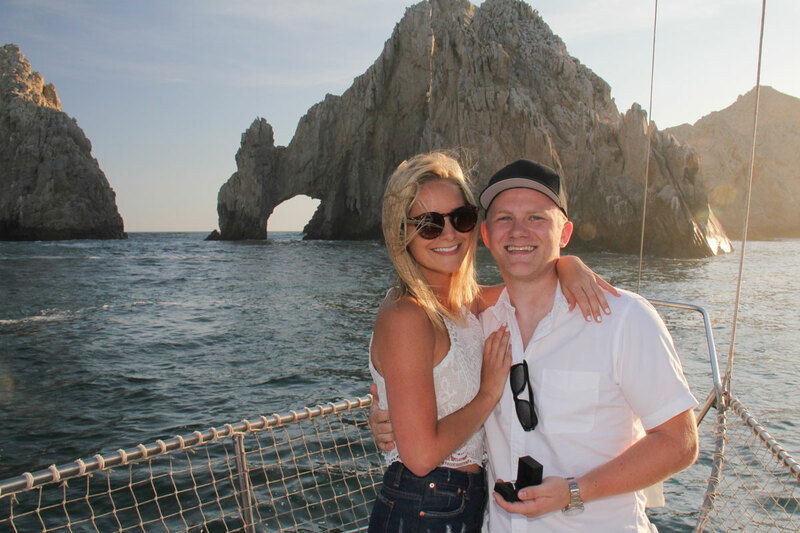 • We only offer private Cabo tours so every guest enjoys a VIP experience. 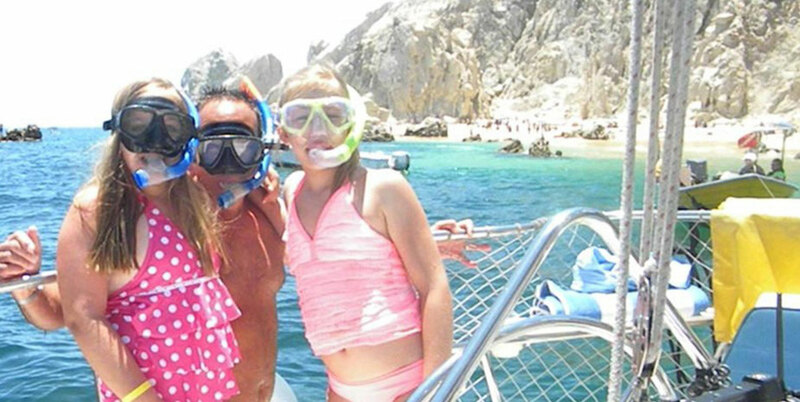 • Children 12 and younger enjoy all our Cabo Sailing, Snorkeling, Whale Watching & Sunset tours FREE. • Cabo Sails is the only sailing company who has lifeline netting all around the decks of our boats for your safety. • We offer the finest selection in our premium open bar which includes Don Julio white tequila, Absolut Vodka, Johnnie Walker Red, Bacardi and Captain Morgan’s Rum, margaritas, cabernet sauvignon and chardonnay wine (Santa Carolina Reserva), Pacifico, Corona, sodas (Coke, Diet Coke, Sprite, Fresca), juices (orange, cranberry, Clamato) and bottled water. • Our premium open bar is included in the price. Other companies charge guests extra for premium beverages which are not the same quality brands. • We serve your beverages in stainless steel insulated cups so they are always nice and cold. • All of our sailboats have thick fully cushioned cockpits and decks for ultimate lounging comfort. • Our sailboats are cleaned after each tour and clean towels are placed over the cushions so you enjoy the best sanitary conditions possible and are not sitting on hot cushions where other guests were sitting. 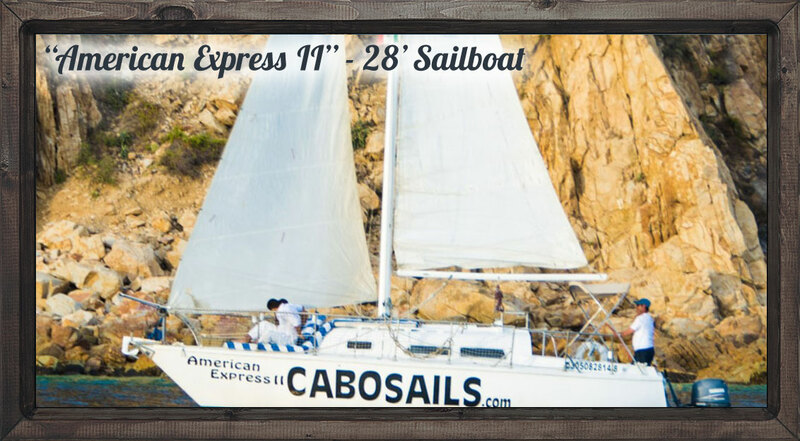 • Cabo Sails specializes in a smooth sailing experience and not extreme sailing for the safety of our guests. • We have all permits, insurance and safety equipment required. 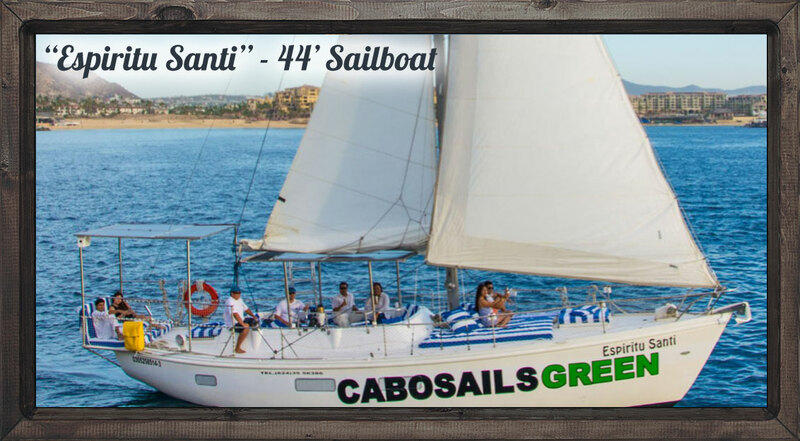 Cabo Sails offers the only 100% solar-powered sailboat (44’ Espiritu Santi) in Cabo San Lucas which is powered by an electric engine and solar panels. Espiritu Santi offers guests an eco-friendly sailing experience that creates a peaceful ambience as they help keep Los Cabos waters blue and pristine. Cabo Sails is helping to minimize the carbon footprint left behind by responsible travelers who are mindful of the wonders of Los Cabos. We require 72 hours cancellation notice prior to your tour to refund your deposit. If the weather is bad, we will do our best to reschedule your tour or reimburse 100% of your deposit through PayPal in U.S. dollars. 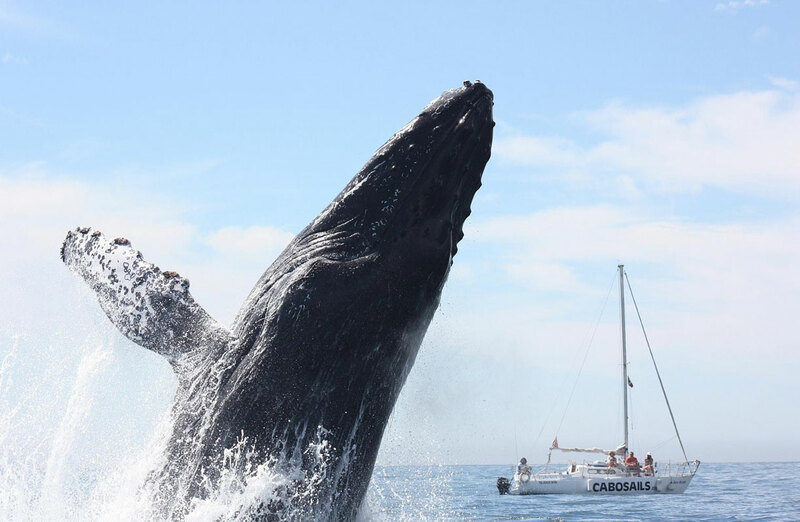 Choose the Sailboat or Catamaran of Your Choice & Enjoy Cabo Sailing, Snorkeling, Whale Watching & Sunset Tours. 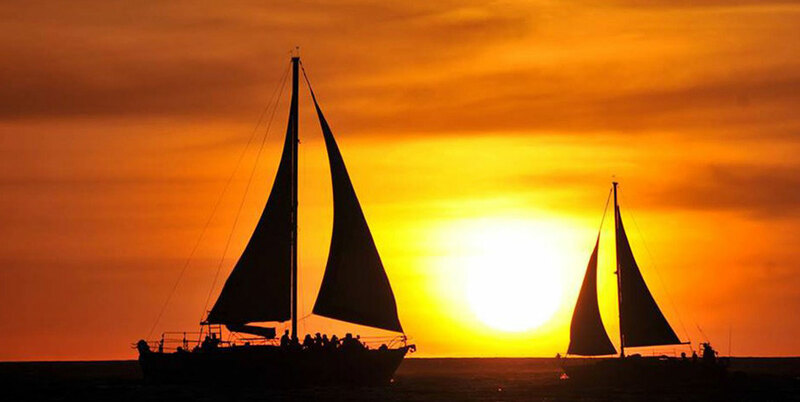 You will enjoy Cabo sailing in the Pacific Ocean, Sea of Cortes and the Cabo San Lucas Bay weather permitting and ending the perfect day with breathtaking panoramic views of the sun approaching the horizon. 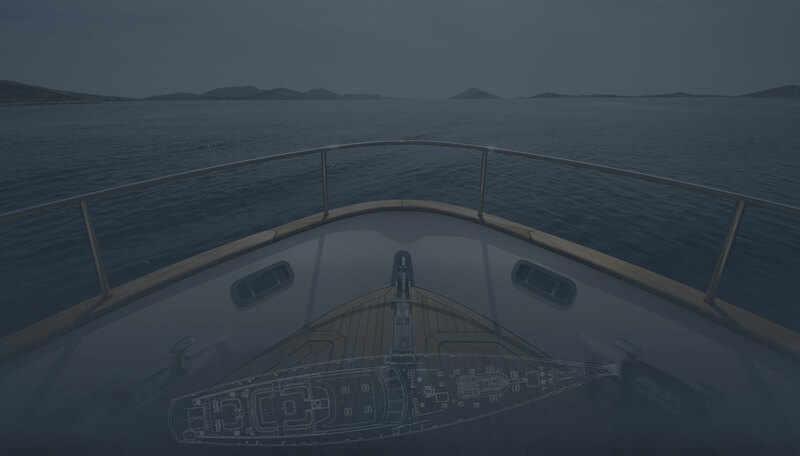 Private charter pricing based on boat and number of passengers – as little as $83 per person! • 2 Paddle boards included upon request only for no additional cost. Paddle boards are subject to weather conditions. Everything is included except towels and gratuities for the crew. Most guests tip between 15-20%. Once we receive your deposit, we will send your confirmation with all the details within 24 hours. 44′ Coronado sailboat built in the USA, the only 100% eco-friendly sailboat in Cabo powered by solar panels and an electric engine. Sun and shady areas for 2-18 guests. Alegria is a modern, roomy and very comfortable 33′ Hunter sailboat built in the USA. 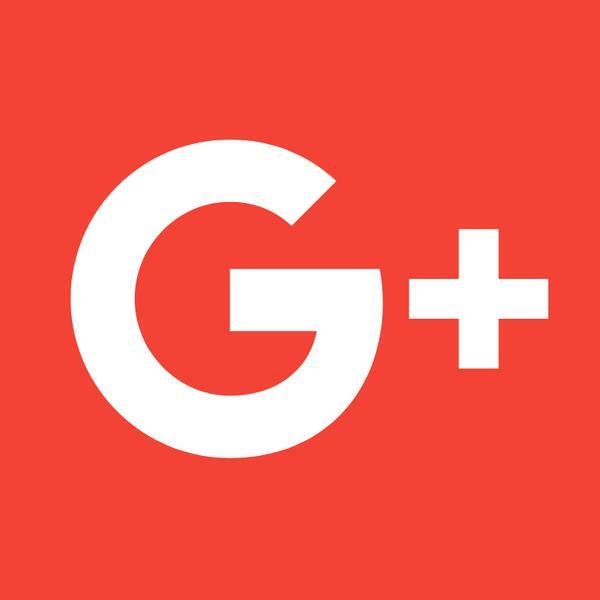 It is North America’s leading sailboat and one of the most popular makers in the world. Offers fully cushioned deck and shaded cockpit accommodating up to 8 guests maximum. Sol Mate is a beautiful, roomy and very comfortable 30′ Islander sailboat built in the USA. Offers fully cushioned deck and shaded cockpit accommodating up to 8 guests maximum. American Express II is a very comfortable and easy to sail 28′ Pearson sailboat built in the USA and one of the top brands. She is fast and smooth. Offers fully cushioned deck and shaded cockpit accommodating up to 4 guests maximum. 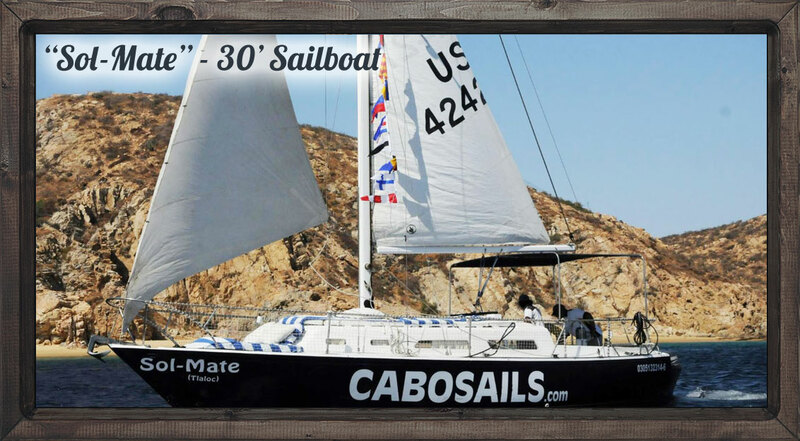 What Makes Cabo Sails Different From Other Companies? Cabo Sails is the premier Cabo sailing company with 16 years of offering our guests exceptional quality and service. We only offer private Cabo tours so every guest enjoys a VIP experience. We serve your beverages in stainless steel insulated cups so they are always nice and cold. We offer the finest selection in our premium open bar which includes Bacardi and Captain Morgan’s Rum, Absolut Vodka, Johnnie Walker Red, Don Julio white tequila, margaritas, cabernet sauvignon and sauvignon blanc wine, sparkling wine, Pacifico, Corona, sodas (Coke, Diet Doke, Sprite, Fresca), juices (orange, cranberry, Clamato) and bottled water. 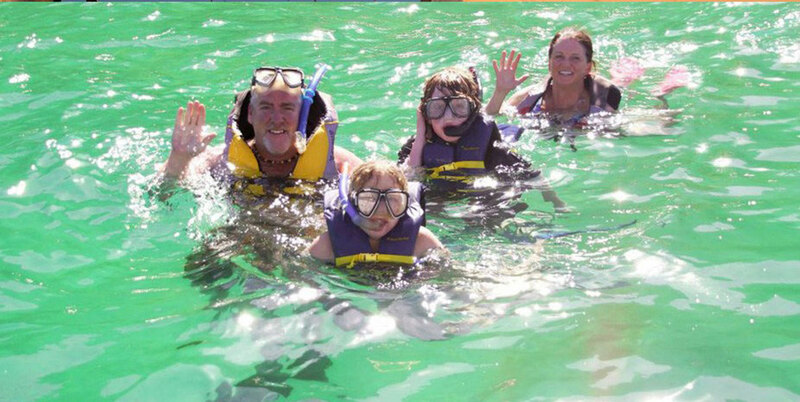 Children 12 and younger enjoy all our Cabo Sailing, Snorkeling, Whale Watching & Sunset tours FREE. We have all permits, insurance and safety equipment required. Cabo Sails is the only sailing company who has lifeline netting all around the decks of our boats for your safety. All of our sailboats have thick fully cushioned cockpits and decks for ultimate lounging comfort. 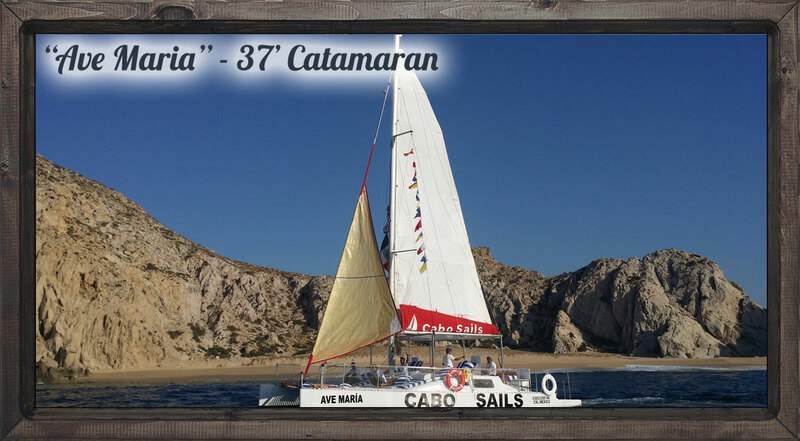 Cabo Sails specializes in a smooth sailing experience and not extreme sailing for the safety of our guests. Our sailboats are cleaned after each tour and clean towels are placed over the cushions so you enjoy the best sanitary conditions possible and are not sitting on hot cushions where other guests were sitting. With bilingual, knowledgeable and very accommodating crew. Appetizer size beef burritos, cheese quesadillas, Mexican chicken salad, fresh guacamole, salsa and chips. Please let us know if you prefer vegetarian or gluten free and have any food restrictions. Bacardi and Captain Morgan’s Rum, Absolut Vodka, Johnnie Walker Red, Don Julio white tequila, margaritas, cabernet sauvignon and sauvignon blanc wine, sparkling wine, Pacifico, Corona, sodas (Coke, Diet Doke, Sprite, Fresca), juices (orange, cranberry, Clamato) and bottled water. Provided for guests 7 years and older. Provided for guests 3 years and older. El Arco (Land’s End Arch), Lover’s Beach, Medano Beach, sea lion colony and the magnificent Finisterra Rocky Point where the Pacific Ocean meets the beautiful blue Sea of Cortes. Provided during the winter month for up to 8 guests upon request only for no additional cost. Two paddle boards are included on board the 37’ Ave Maria Catamaran and 44’ Espiritu Santi sailboat upon request only for no additional cost. Paddle boards are subject to weather conditions. Snorkeling gear is included for all tours. Snorkeling is best for morning or early afternoon departures however if guests want to snorkel prior to the sunset, they are welcome to do so. Cabo San Lucas, Baja California Sur, Mexico. Cabo Sails check-in office is located in Plaza Mexicana (previously known as Plaza Gali). Ask your driver to drop you off at Plaza Mexicana across the street from Sandos Finisterra Hotel. Walk a short distance into the plaza and our check in office is located behind the OXXO market. If you have your own rental car, there is hourly parking available in the API parking lot next to Plaza Mexicana.